Say goodbye to organisational dilemmas, tensions, conflicts and stress with Solving Impossible Problems. Impossible problems are those that will not easily be solved. They twist and turn and defy resolution. When you think you have them nailed down, they loop, split and flip, taking you round in circles until you find yourself back at square one. The ability to manage tensions, paradox and uncertainty in business is becoming a much sought after leadership skill. ‘Paradox Management’ is a new but increasingly essential field in the area of business management and will be highly influential in the ongoing sanity and success of all organisations and of the people who work for them. Solving Impossible Problems will give you a greater understanding of organisational tensions and paradox. You will learn how to recognise these ‘twisty turny’ problems and then use practical tools to resolve them or use them for innovation. This book is a unique guide to greater innovation, heightened wellbeing and enhanced thinking power through the revolutionary process of Paradox Management. Linda Holbeche, Author & Research & Practice Director, CIPD. Jacqueline Dowsing, Senior Learning & Development Officer. Henrietta Laitt, Trainer, Coach, Supervisor, Psychotherapist. Ed Luttrell, Director & Principal Coach. Apivat (Paul) Hanvongse, PhD Student. “I wish I had read this book sooner. This book takes you on a journey through Joe’s experience of working with paradox within an organisational setting. The short stories of people getting into knots over dilemma’s and challenges in the work place resonates with past experiences. As you read on, the number of times you think “that happened to me” or “I knew someone who had that problem” and then those “ah ha” moments when it starts to make sense. Then comes the important bit. How to change your thinking to transcend the problem. The book doesn’t leave you there. it then gives practical tools to help work with paradox within a group setting. * What are impossible problems? * Is paradox always negative? * Why understand and manage paradox? 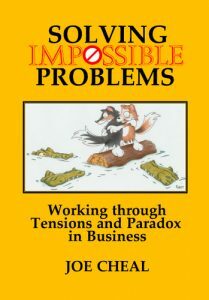 * Where do impossible problems occur within organisations? * What is dialectic logic? * What is trialectic logic? * The positive side of uncertainty? * Is win/win really possible? * Can paradox be managed?